Located in a prestigious area of Basel, these office spaces are provided with a wide range of high standard services offered by professional and skilled support staff: virtual office services, legal domicile and branch set up. They are available at flexible rental terms and convenient price and benefit from a strategic location in Basel, one of the most dynamic regions of Switzerland. The centre is just a few minutes from the main railway station for connecting services to the airport. This entrepreneurial environment within the heart of Basel is perfectly suited to innovative young entrepreneurs. Office desks are equipped with an ergonomic office chair, lockable roll container and a locker to store personal items while members have access to a meeting room and a small kitchen. All within less than 15 minutes walk from the office are Mittlere Brücke, City Hall and the Basler Cathedral. An impressive centre situated in a stunning tower building complete with a solar panel facade. Here, furnished offices can be let on flexible terms at affordable prices. Tenants can make use of the high-speed internet, meeting rooms, conferencing suites and 24-hour access. In addition, the local area is filled with ample transport connections and hotels for client visits. The Münchensteinerstrasse Bus and Tram Station can be accessed with ease. Local amenities also surround the area providing great opportunities for relaxing outside of the office. Offering a great range of modern and professional office spaces in the heart of Basel, this prominent structure in the Basel skyline is located in one of Switzerland's dynamic commercial regions. The neighbourhood is home to several large organisations, including industry leaders in a range of sectors. The building offers private offices, coworking solutions, meeting room access and more. Secure underground car parking can be found on-site. Opening in March 2019, this modern business centre is set to provide flexible coworking in a convenient location. With flexible terms and transparent prices you can take space with the possibility of expansions and relocation. An all-inclusive fee ensures you're not caught out by hidden fees and your membership will include a range of amenities such as high speed internet, access to meeting rooms, reception services and the support of a professional team. A massive office space equipped with numerous workstations is available at flexible rental terms in a prestigious business district in Basel. Elegantly decorated, this office space is equipped to a high standard and provided with spacious meeting rooms, videoconferencing facilities, lounge area and a full list of facilities and services. It benefits from a friendly and professional staff available to assist your business in any administrative task to help you concentrate on your core business. Located within walking distance of the main railway station, this office is served by various transport links. 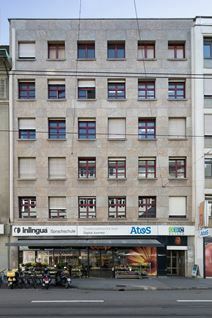 From the top floor of this building in Basel's city centre, this modern business centre offers a choice of co-working space or top-class private office space. As well as airy and light workspace, tenants also have access to an on-site fitness centre and a shopping mall that is connected to the building. There centre is also connected to the shopping mall, providing you with all the mundane amenities you could possibly require.